Dominant wins highlighted the Bill Dellinger Invitational on Friday. 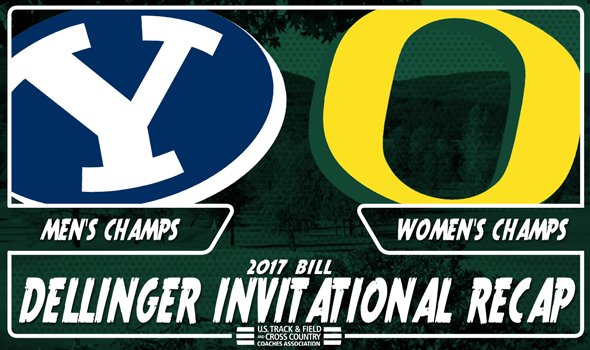 BYU’s men and Oregon’s women rolled to team titles at the Springfield Golf Course. Clayton Young of BYU and Katie Rainsberger of Oregon nabbed the individual crowns. Read that again: 17 points. BYU didn’t just win the race. It made a statement. The sixth-ranked Cougars stomped the competition as they finished 1-2-3-4 with Clayton Young (first, 23:42.4), Rory Linkletter (second, 23:43.4), Connor McMillan (third, 23:44.0) and Casey Clinger (fourth, 23:46.9). Young, Linkletter, McMillan and Clinger all crossed the finish line less than five seconds apart. Washington’s Colby Gilbert (fifth, 23:47.4) and Stanford’s Alex Ostberg (23:48.8) kept BYU from sweeping the meet clean as its fifth runner Daniel Carney took seventh in 23:49.5. In fact, Gilbert, Ostberg and Oregon’s Cooper Teare (ninth, 23:52.3) were the only three non-Cougars in the top-10 (BYU’s Brayden McLelland and Jonathan Harper took eighth and 10th). No. 2 Stanford and No. 8 Oregon quadrupled the Cougars’ output with 73 and 75 points in second and third, respectively. Washington and Gonzaga were fourth and fifth. This was the second signature victory in as many years for BYU. Last year the Cougars upset top-ranked Syracuse at the Panorama Farms Invitational. The Women of Oregon followed Katie Rainsberger’s lead on Friday. Rainsberger won going away and the reigning national champion Ducks did, too. No. 2 Oregon watched Rainsberger shatter the course record by 37 seconds with a time of 18:47.6 and then put the rest of its scoring lineup in the top-15 to notch 33 points. Lilli Burdon (19:05.8) and Jessica Hull (19:07.8) finished second and third, respectively, while Carmela Cardama Baez (12th, 19:24.3) and Susan Ejore (15th, 19:35.2) impressed in their debuts with the Ducks. No. 5 Stanford, led by Vanessa Fraser (fifth, 19:12.5), Fiona O’Keeffe (seventh, 19:16.3) and Abbie McNulty (10rth, 19:20.4), took second in the team standings with 66 points. No. 19 BYU finished third behind Oregon and Stanford, mainly because it didn’t have any runners in the top-10. The Cougars did, however, go 11-13 and then 17-18-19. Runners who finished in the top-10 and have not been named yet included Portland’s Jasmijn Lau (fourth, 19:08.6), Washington’s Amy-Eloise Neale (sixth, 19:15.7), UCSB’s Jenna Hinkle (eighth, 19:17.6) and Portland’s Taryn Rawlings (ninth, 19:19.8).